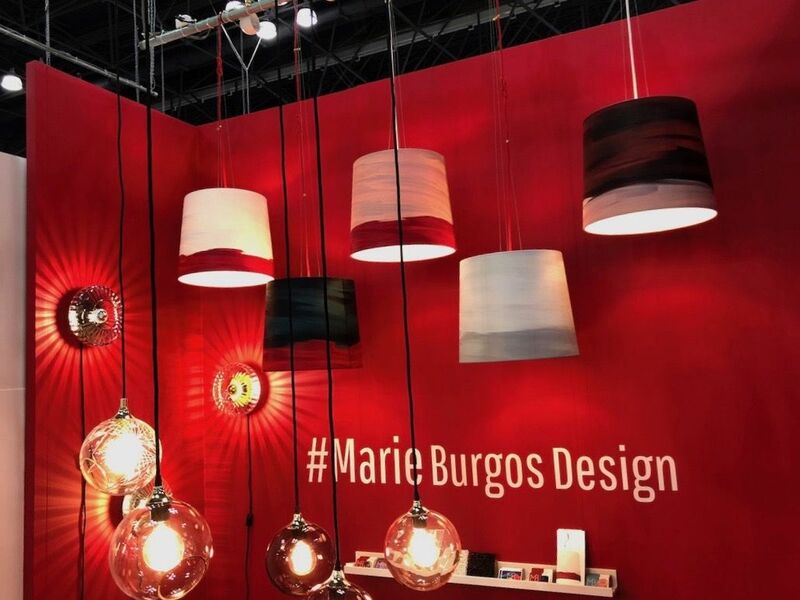 New designs from international brands big and small were on show at in New York City. 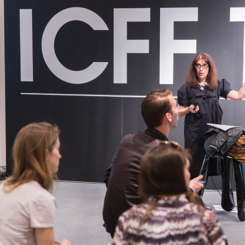 One of the most exciting design events of the year, the fair is the largest in line-up comprising the city’s annual celebration of design, NYCX. 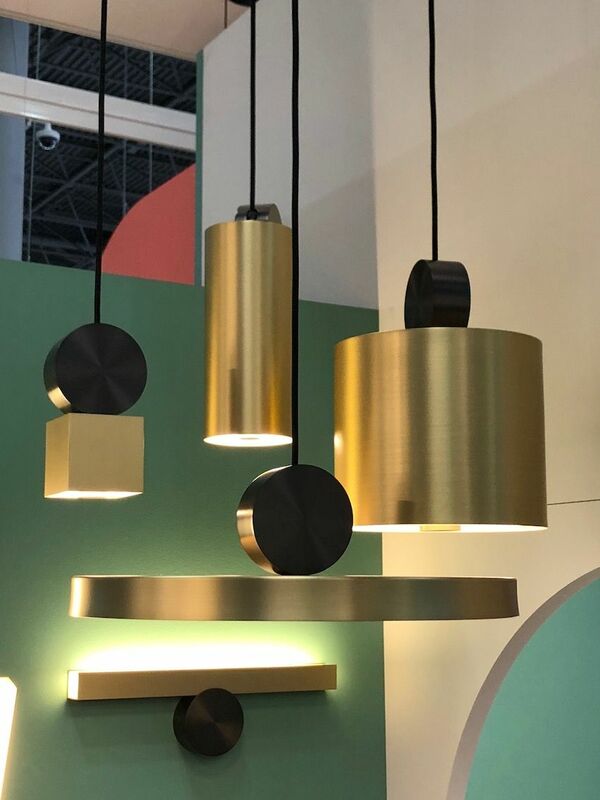 The 2018 edition did not disappoint, with modern and contemporary design innovations in all types of furnishings, lighting and decor. 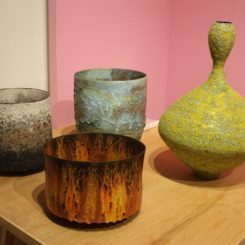 Shumatsu Distortion prowled the aisles and collected these picks and trends to inspire your interiors. 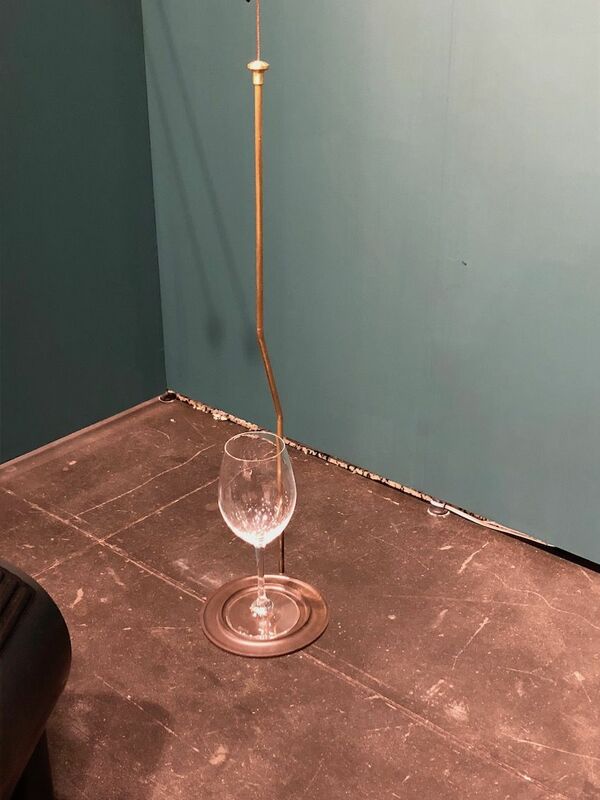 The chandelier is also available in a brass finish. In a spectacular display of minimalist design, geometric credenza is paired with two of Tgempo chandeliers. The striking lights frame the setting below, which is highlighted by the two black Os tables. The occasional tables are made of aluminum with brass screws, sealed with a wax coating. Linear geometry and the carved patterns are characteristic of the Tabwa culture. 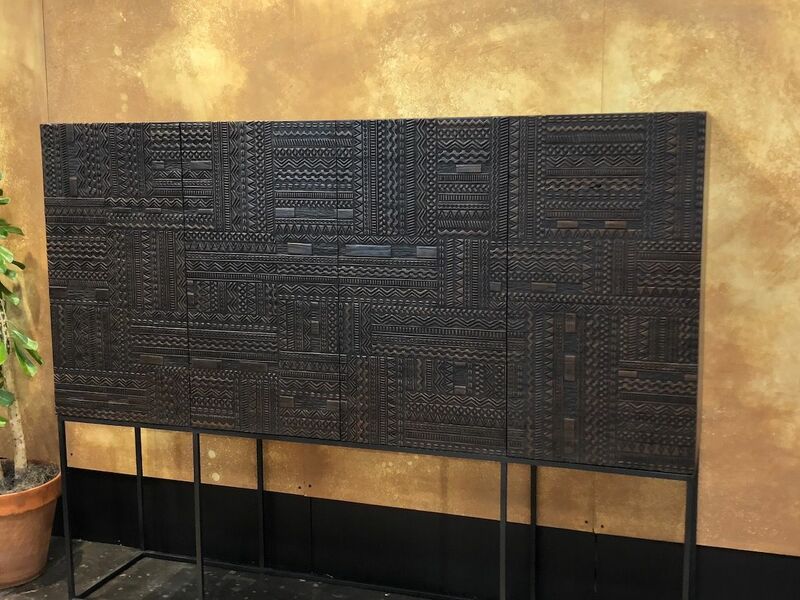 We couldn’t help but be drawn to Ancestors Tabwa Sideboard and its complex carved facade. 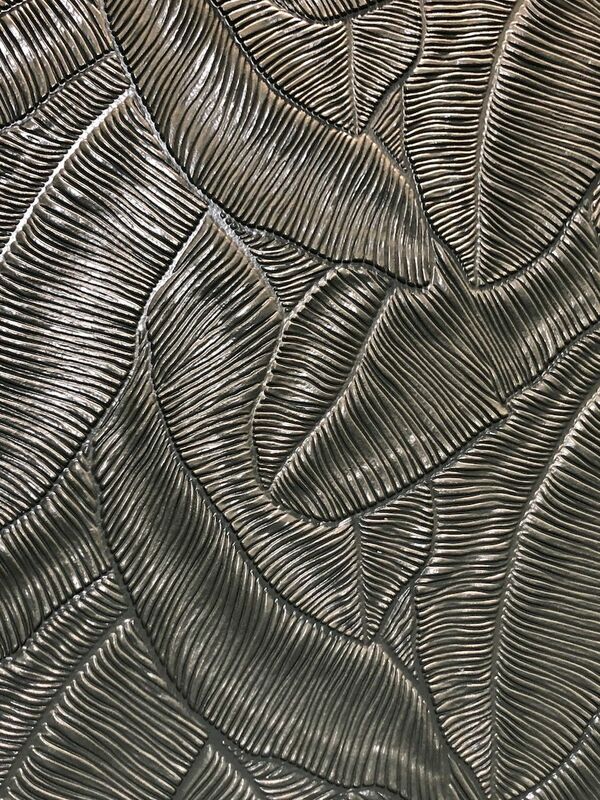 The basic, rectangular shape of the design by designer Carlos Baladia only served to highlight the patterns, each of which was carved by artisans. 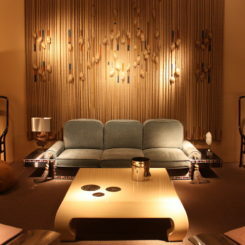 The name comes from the Central African Tabwa culture, which inspired the design. 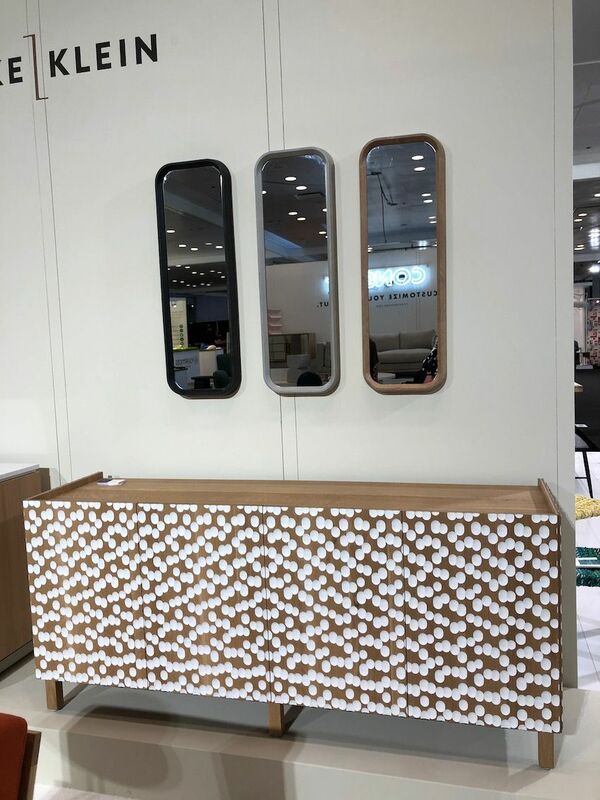 The sideboard is available in two sizes. These pieces fashionably hide the outlets every tech user needs. 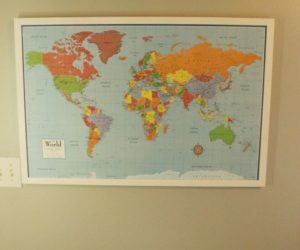 has solved the problem of connectivity in the most stylish way, with USB outlets quite literally hiding in plain sight. Many of their pieces are wired for power. The occasional table has outlets embedded on the flat side that faces the chair and the decorative ball at the bottom of the lamp also incorporates a USB outlet. Danish design is always a classic choice that works with many interiors, which is why we really like . 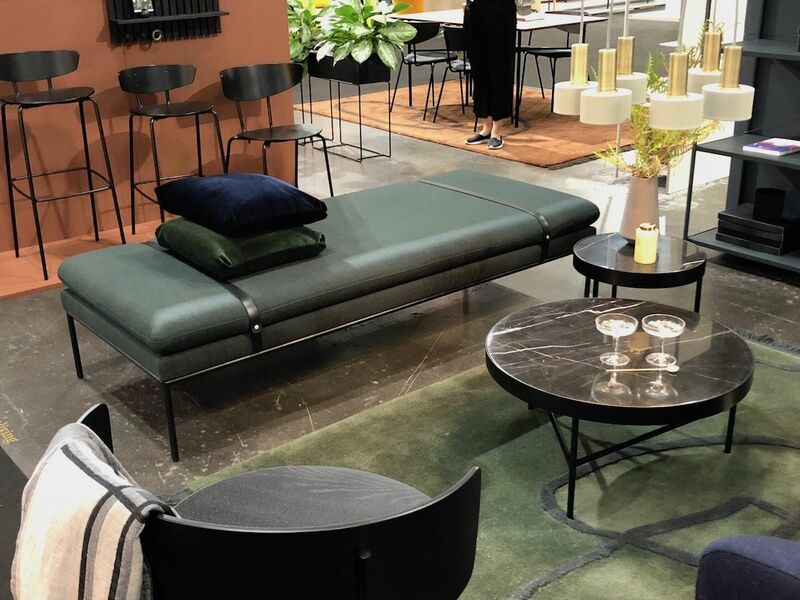 The Turn daybed is a sleek choice, with its minimal metal legs and deep green leather upholstery. Two leather belts hold the long cushion, which also adds a modern design detail. Although it’s available in other upholstery options, the leather is particularly nice. The pair of marble tables is the perfect accompaniment. Clean-lined and versatile, this credenza would work in almost any room. They call it a credenza but it’s a bit more like the modern replacement for a traditional buffet. modular Strata Credenza can be configured for a customer’s needs, with or without the shelving, in a range of woods and metal finishes. 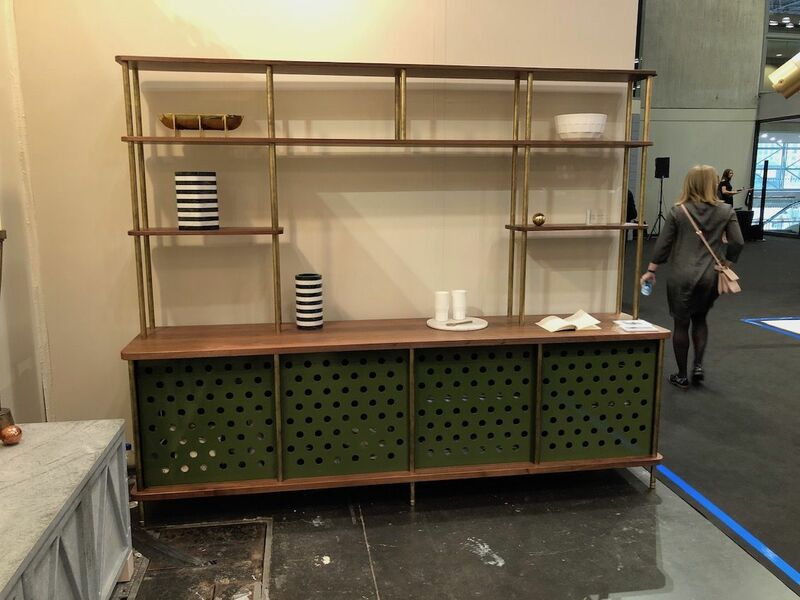 This design has striking moss green aluminum doors, brass rods and walnut shelving. We would love to see this replace lots of those old, tire hutches out there. The solid wood credenza is customizable. The Flow credenza from is a great pop of pattern for a space without adding any color to the design scheme. Made using a combination of traditional woodworking techniques and high-tech machine work, the carved surface is highlighted with white in each little scooped out space. It creates an immediate focal point and will have you guessing whether the white spots are concave or convex. A bright hue adds character to these hand-crafted cabinets. Sometimes a small but stylish cabinet is what you really need and these from certainly fit the bill. The Los Angeles-based brand hand-crafts their pieces locally, inspired by Mid-Century design. 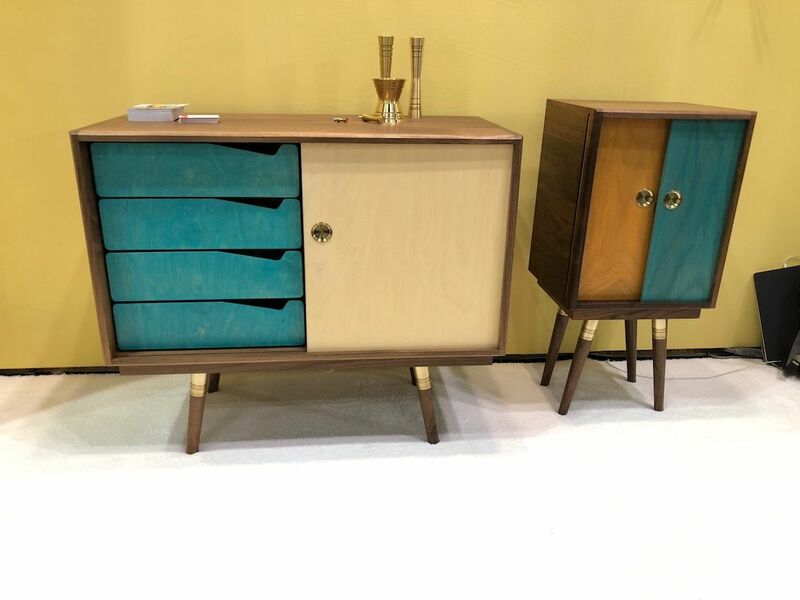 This is the Beaker cabinet on the right, which has brightly hued sliding doors on the front and brass pulls. The cabinet on the left is larger and features a set of drawers. It is especially nice to have the drawers highlighted as an integral part of the design rather than hidden behind a door, or as a typical row of fully closed units. 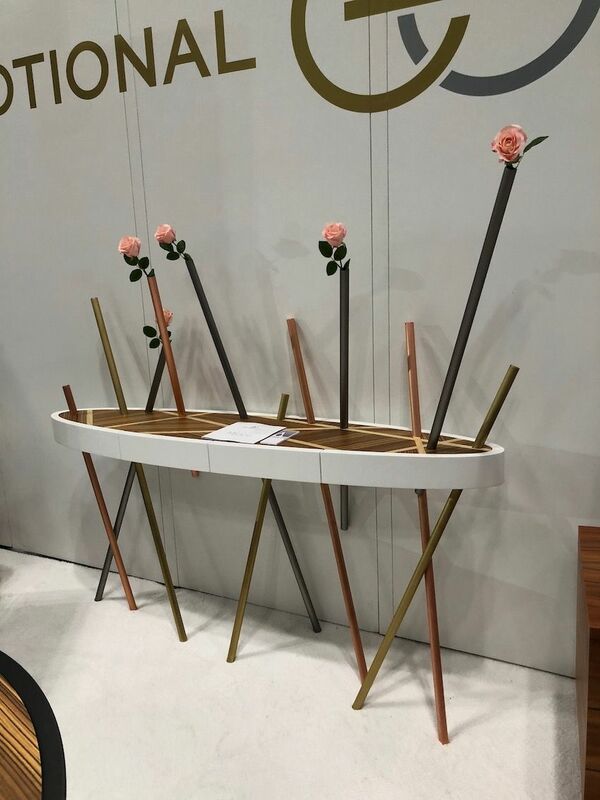 This year, the French area of ICFF featured a series of vignettes highlighting different designers and different aesthetics. 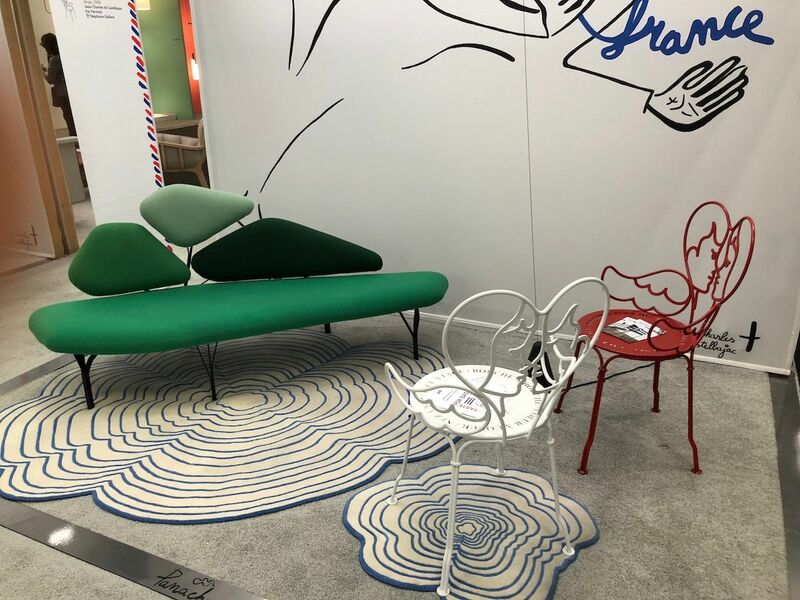 This room, called “Panache,” features the Borghese sofa by Noe Duchaufour Lawrance in a series of green hues, and whimsical Ange chairs for Fermob by Jean-Charles de Castelbajac. The Rodeo Chair also comes with a padded seat attachment. 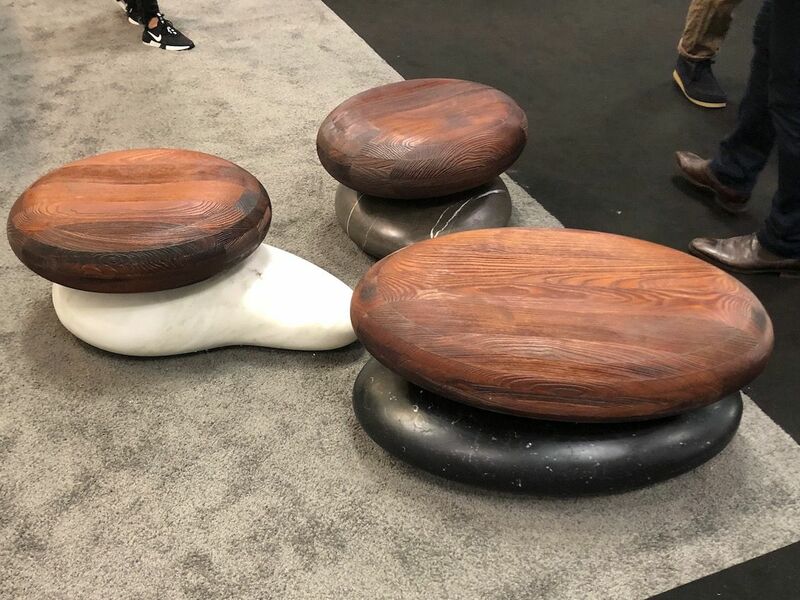 Healthier seating was trending at the show with a number of exhibitors presenting seats that are better for the back. Our favorite was the , from Norway. In a design that started in a schoolroom experiment to give children better seating, the Rodeo is now available for adults as well. The chair focuses on movement, ergonomics and spinal health, and it helps strengthen the back while sitting. 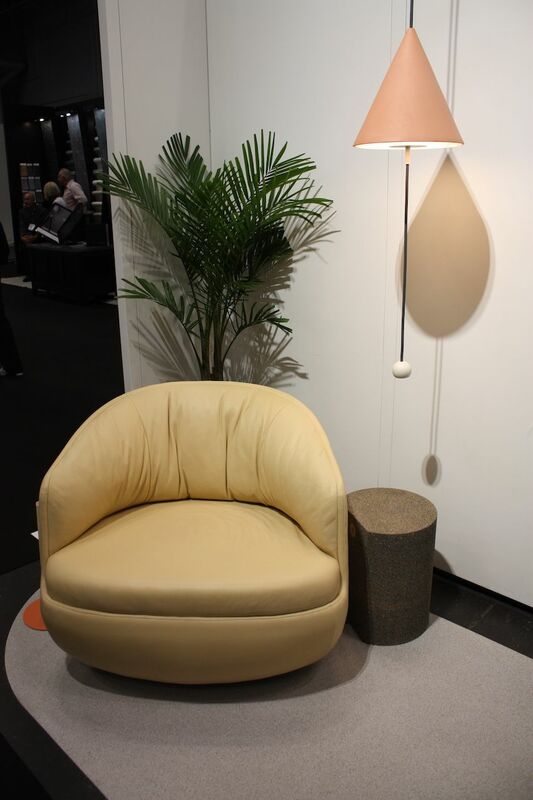 It is the same concept as the yoga ball seat, but with a more stylish and streamlined silhouette. The chair is also a design showcasing the know-how of Italian manufacturing. Finally, this is a fantastically comfortable chair for working, eating or any reason you have to be seated. The gold base is a glamorous element. Plush, sumptuous and oh-so-inviting, Deep Tuft Sofa designed by Harvey Probber is a really versatile piece. 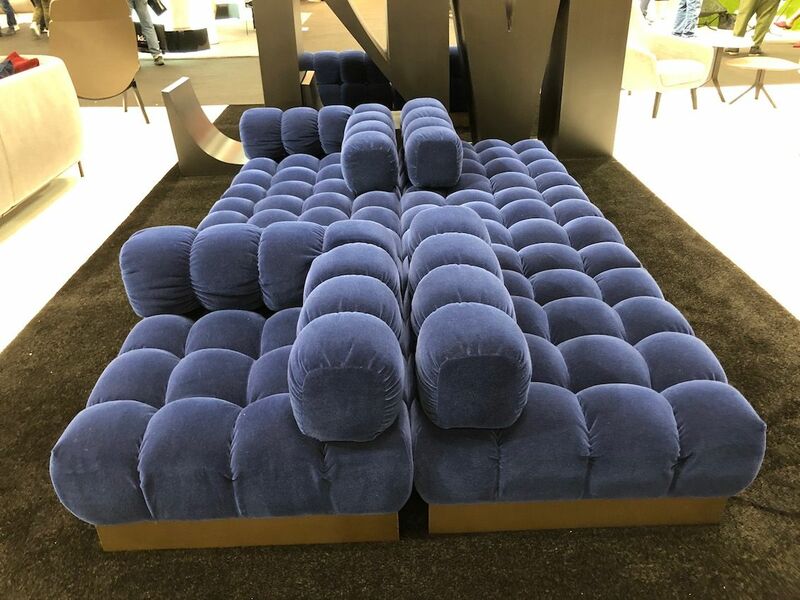 The modular sections allow you to configure different sizes and rearrange them into unique combinations like this one that has smaller seats as well as a long sofa section. The velvety upholstery only adds to the drama, creating a sofa that makes a sophisticated statement. 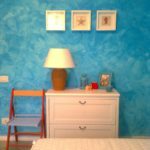 Daring color choices create an immediate statement for a room. While you could upholster this sofa in more muted tones, we love the bold explosion of color in this version from Studio of Brooklyn. 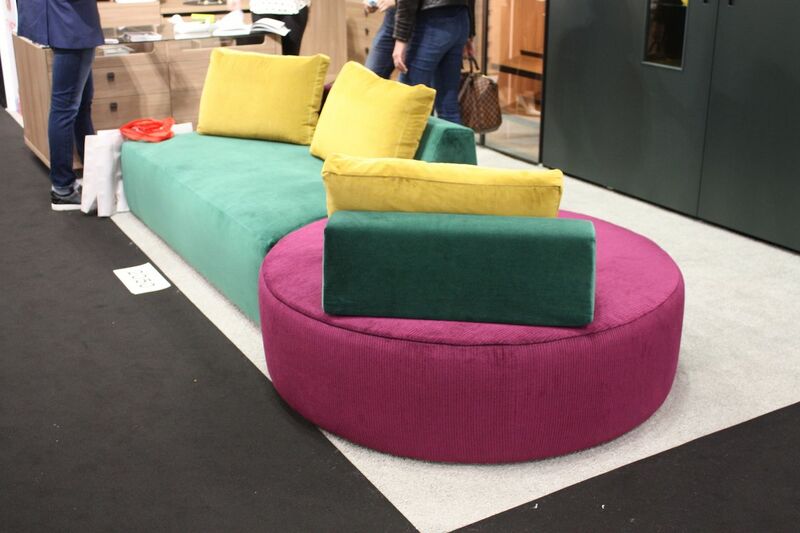 The vibrant hues emphasize the varied shapes of the sections as well as the cushions. The pink fabric has a touch of texture in the subtle striping that also sets it apart from the other pieces. 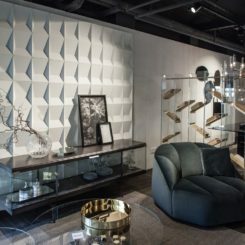 The studio’s typical work falls into a decidedly neutral palette, however, this piece is a bold stroke of creativity for any living room. The benches are super sturdy and very comfortable. 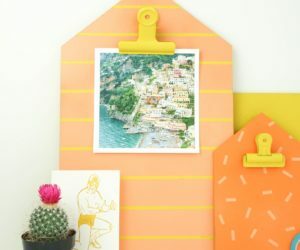 An equally bright and sunny product comes from a new collaboration between and acclaimed fashion and print designer Calla Haynes of Paris. 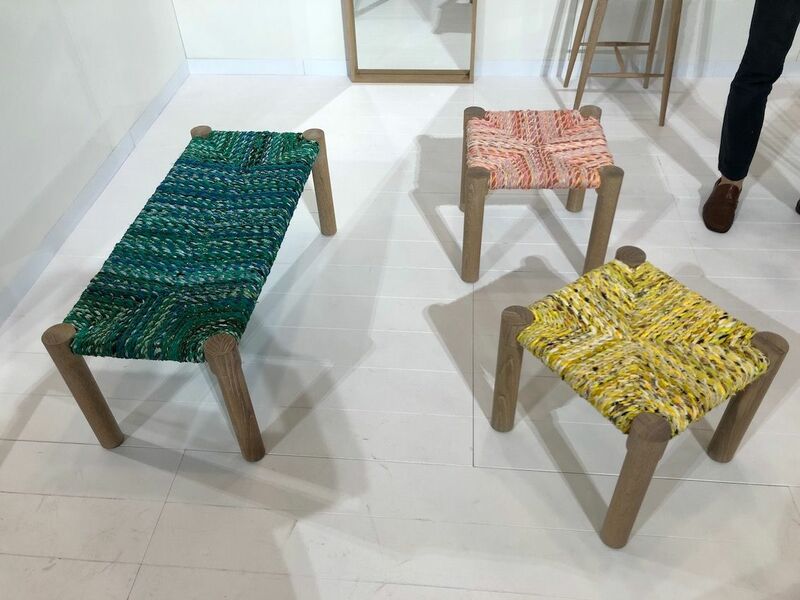 The Marrakesh stools and benches are inspired by footstools that are typically found in Morocco’s souks. 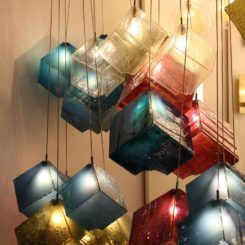 Beyond being carefully handcrafted and delightful to look at, the pieces are also made from recycles material. 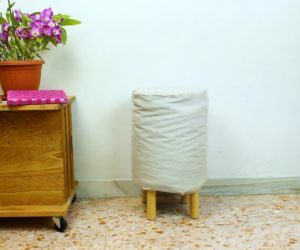 The seats are made from recycled waste fabric from French luxury fashion houses that is twisted to create rag cording just like what traditional Moroccan stools use. Like a forest of multi-hued sculptures, Kreten concrete side tables stand as unique organic forms. The pieces are crated one at a time, cast with concrete in a spandex mold that is formed and sewn up the side. Each one has some slight variances in shape as the hand-poured forms settle into the molds a little differently each time. 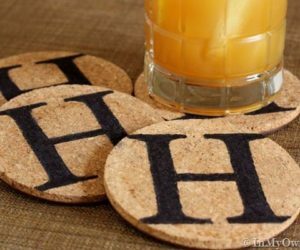 Amazingly smooth and alluring, these would work with interiors of many decor styles. 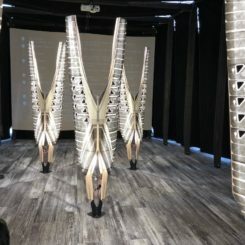 Versions of the Mikado are available in wood, glass and other materials. 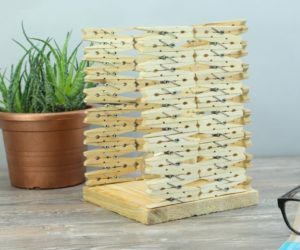 Part table, part sculpture, the Mikado console from is from a collection that is inspired by the pick-up sticks you played with as a child. 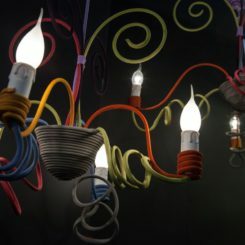 The lightheartedness of the design belies the complex and precise construction required to create the design, with the tubes running directly through the tabletop and various angles. 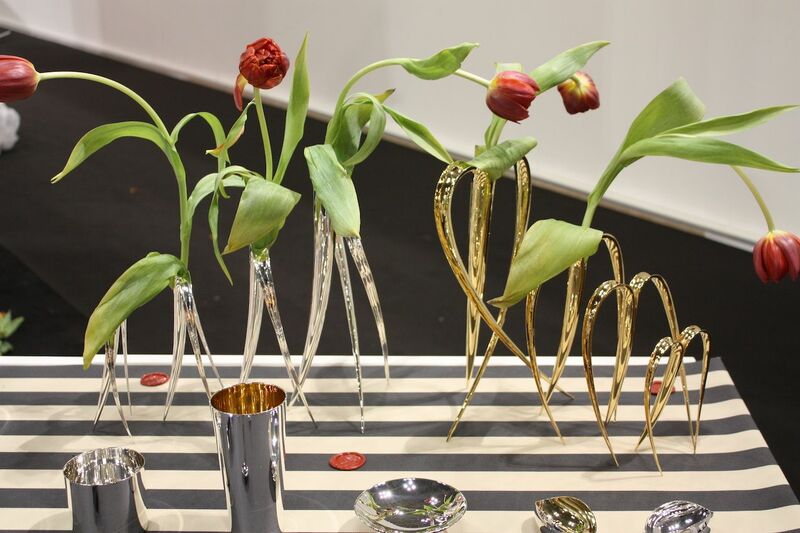 Each tube has a removable cap that allows you to insert silk flowers or even fresh blooms with a special vase insert. A cool copper swing for your drink means you don’t need a table. Oh, do we ever want one of these: A swinging drink table by of Chicago. A cantilevered tray, just big enough for a glass, is suspended from the ceiling to hold your drink. Perfect for spots where you don’t have room for a table — or don’t want one — the table is super handy. Besides, how much fun is that little thing? Just beware if you more than one drink or you might spill! This is definitely a product for the car enthusiast. docking station with speakers is built from real Ferrari parts. 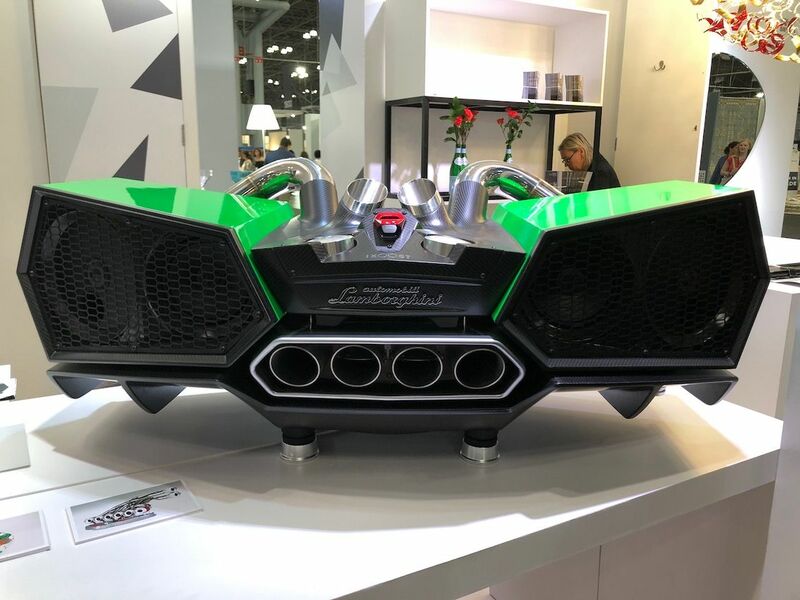 The company says that “the sound of a 12-cylinder engine should be listened to as if it were a symphony” so this sound deck is a fusion of the physical auto instrument with the melody that comes from your favorite tunes. A variety of models with a range of exhaust styles are available. 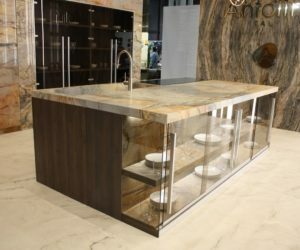 This is the ESAVOX, which can be customized with color and finish options depending on personal preferences. Textural and full of history, the cabinet is all cask wood. 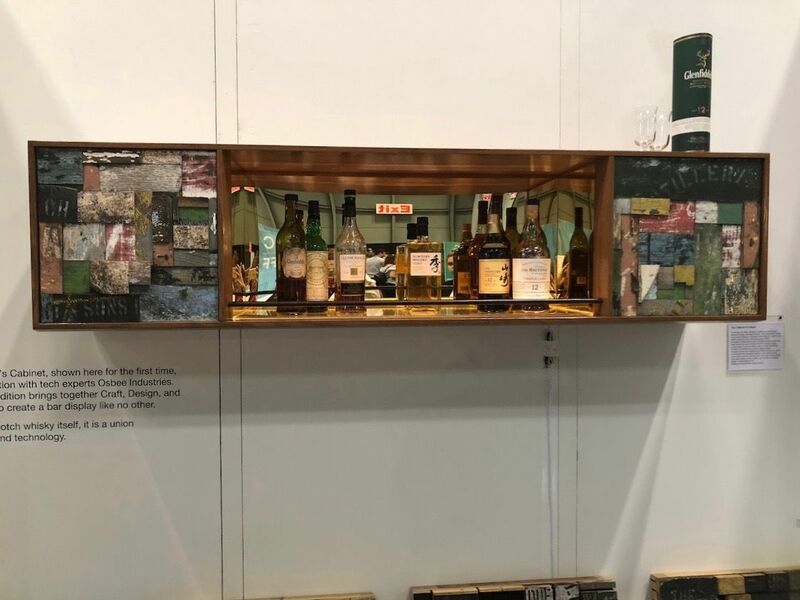 In another artful example of upcycling, the created the Whisky Cask Series, a collection of artworks and liquor display cabinets from casks used at the Glenfiddich Distillery in the Scottish Highlands. The barrels are typically made from Spanish or American oak, and after they are filled and used, they are discarded. The pieces in the series were commissioned for the New York headquarters of William Grant & Sons Distillers Ltd., makers of Glenfiddich. In Scotland, the Malt Barn restaurant at Glenfiddich Distillery in Dufftown also features a large-scale installation. seating system would work just about anywhere. 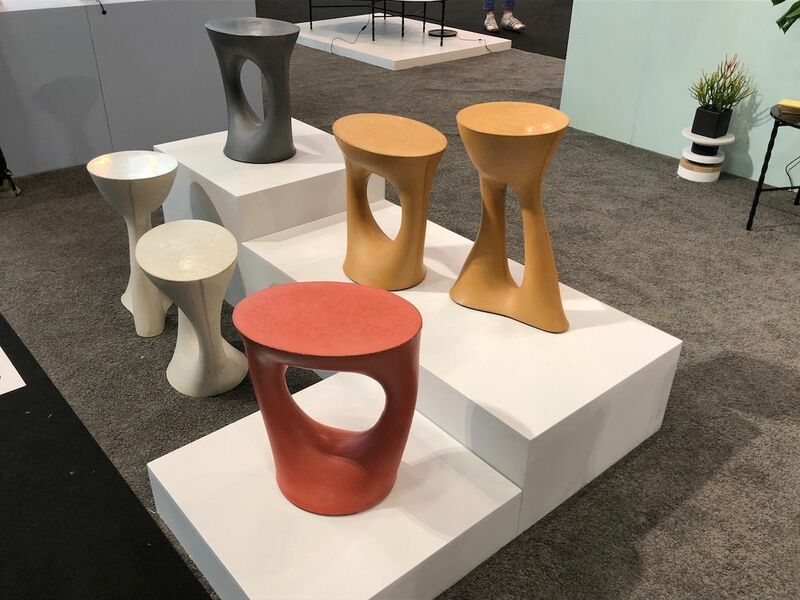 The intriguing design is created with two natural overlapping layers: A base of Kreoo’s signature marble is topped with a wood seat made from bleached or aged larch wood. The marble is available in different colors and the seat comes in three different sizes. 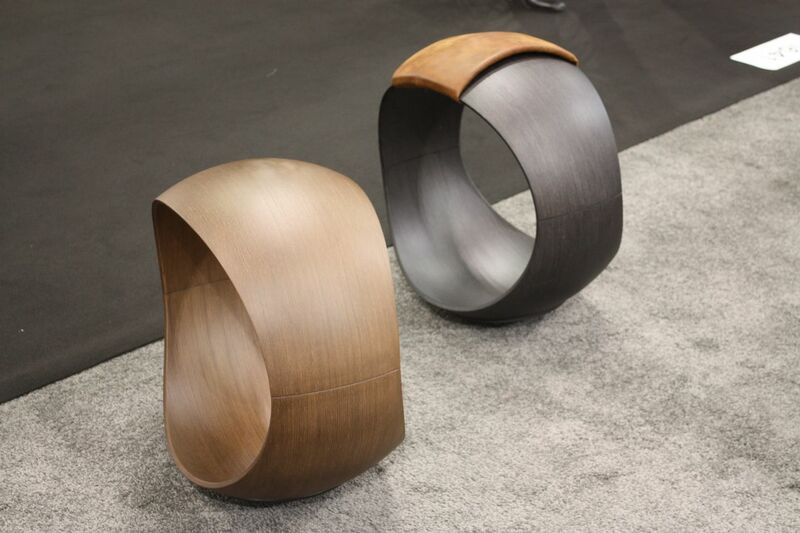 It’s not only a handy seat, but it’s also a stylish sculptural addition to a space. Deep and dramatic textures are enhanced by the final painting process. 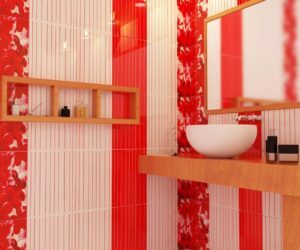 Wall coverings were definitely a trend at ICFF, particularly at this time when new styles of wallpaper are having a moment. Among all the stylish offerings, we were wowed by . 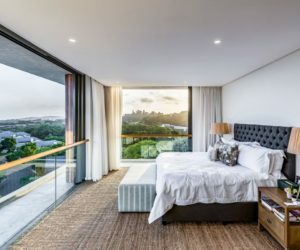 Although it has been around since 1877, the textured coverings are still very on-trend. Originally a success because the process for the deeply embossed covering replaced the painstaking plasterwork that was required for decorative walls at that time, it still offers unique decorating opportunities. Linseed pulp is rolled onto wallpaper in a full range of textural designs and it can then be painted and finished however a designer wishes. 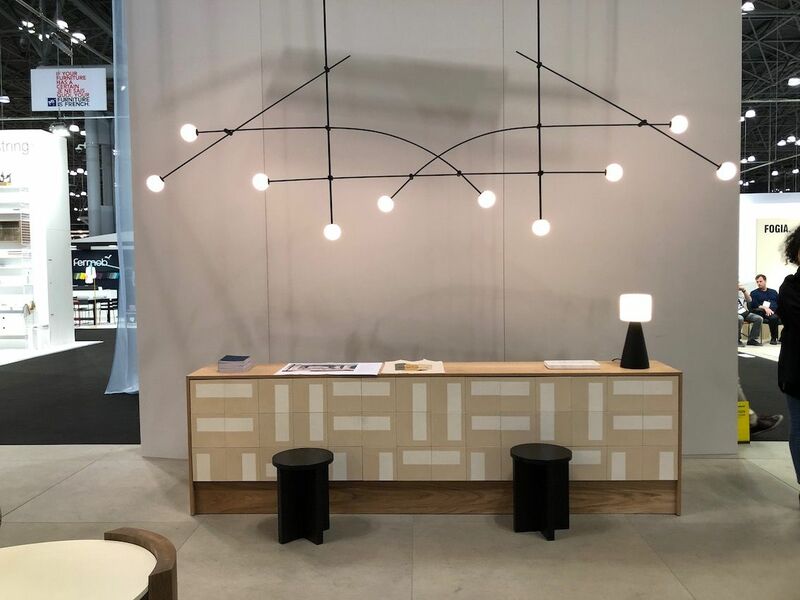 Countless lighting fixtures drew our attention, but we’ve singled out this Calé Collection from of France for its geometric silhouette and overall air of sophistication. 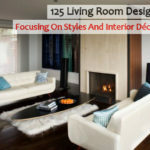 It would be equally at home in a luxury environment as it would be in more modern or contemporary space. The dark discs juxtaposed with the larger brass pieces create a very compelling look. 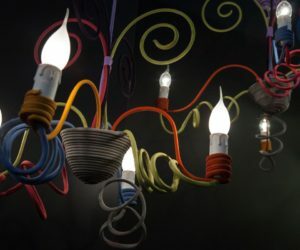 An expanded offering of lights has several appealing selections. 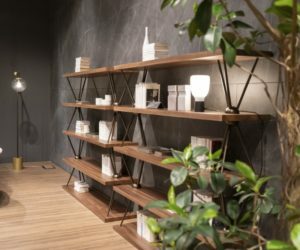 has expanded its range of lighting with a number of new styles, and the wall sconces and hand-painted lampshades are standouts. The Sisters lampshades are part of the “mammalampa” collection and feature a canvas shade painted with strokes that evoke the seaside or a sunset. The wall lamps are made from mouth-blown glass that is hand painted with a silver edge and the cast the most amazing radiant shadow on the surrounding wall. The elegant glass orbs full of bubbles are still playful. 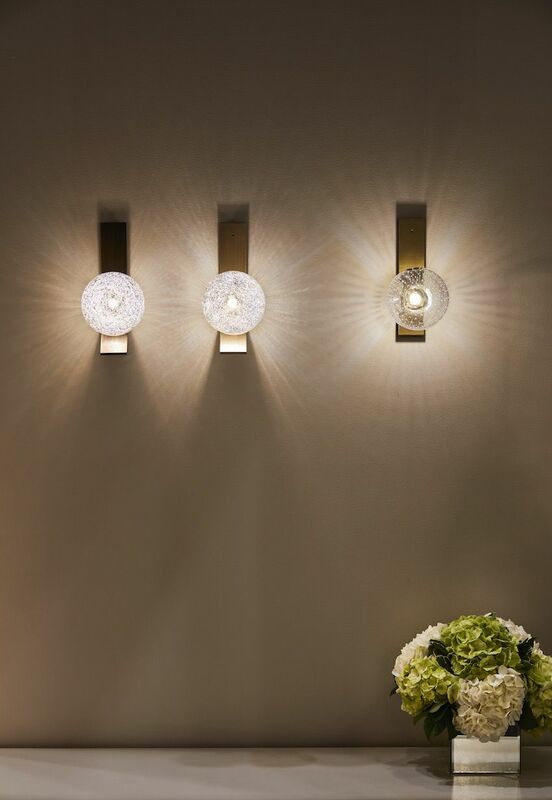 Collection includes wall sconces that cast a really amazing light on the wall that radiates outward from the orb. The effervescent look reminds you of a big globe full of champagne and the interior bubbles almost seem to dance in the spheres. The sconces come with a wall plate that is available in different finishes. While it comes in a table lamp style as well, the wall sconce is a very refined and sculptural choice for a room. 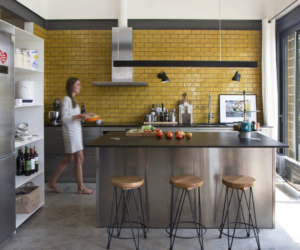 Modular and customizable, these kitchen pieces are a great investment. 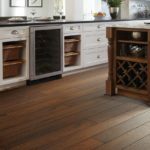 Kitchen furniture is a big investment in a home and if you move, it stays behind for the new owners. That is until now. 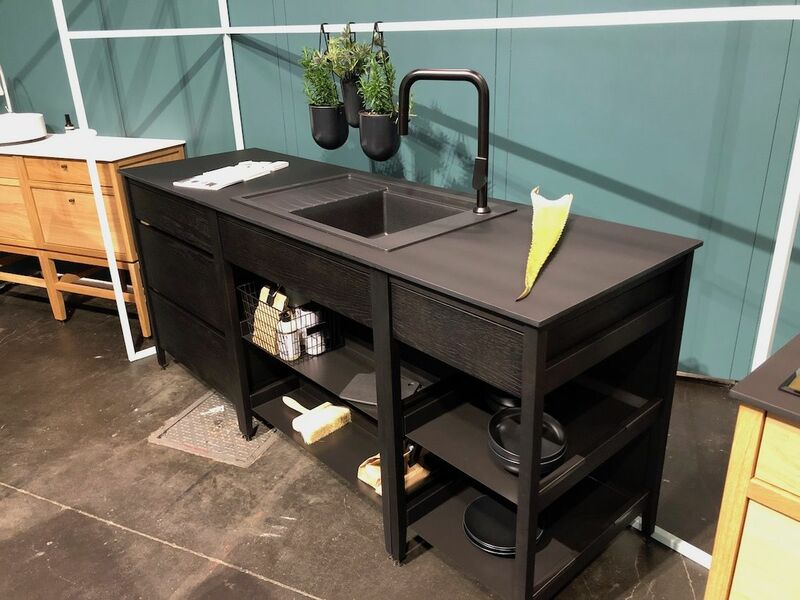 It’s exciting to see a growing market for free-standing, customizable kitchen furniture that is built to last as well as portable. 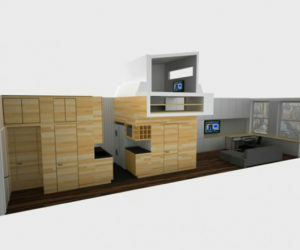 creates storage and worktop units that are permanent along with islands that are portable. 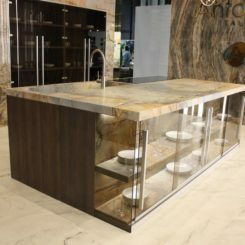 Equally attractive on all sides, the units can be used for more than just typical kitchen purposes. They are great for all kinds of needs in the home. 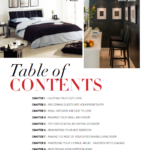 Moreover, freestanding units can be rearranged to adapt a space for multiple functions, like entertaining. 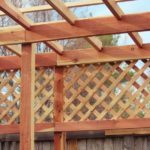 Outdoor collections were more prevalent this year than in the past, heralding a big consumer desire to make outdoor spaces more functional comfortable. Among all the new offerings, this hanging seat from of Mexico was a favorite. Created from lightweight aluminum and weatherproof nautical rope, the seat is sturdy and comfortable — and very light. 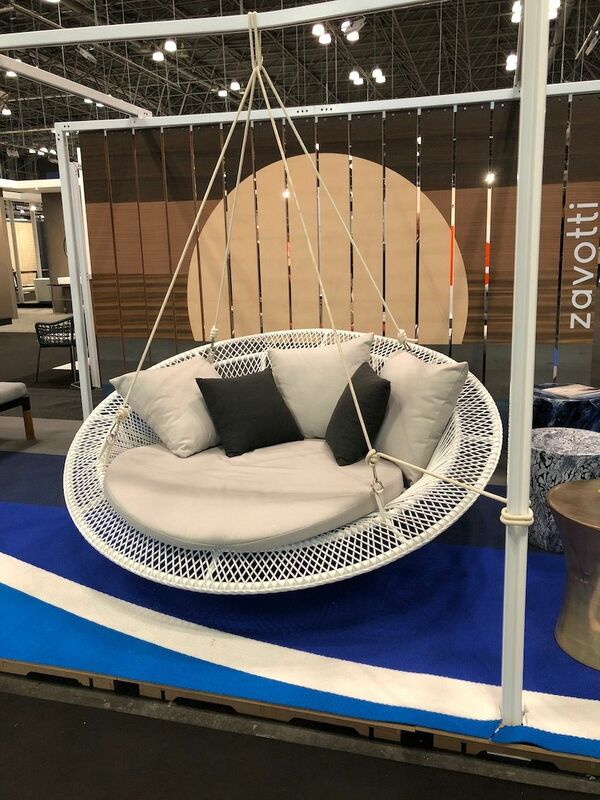 Called the Lucia Swing, the name means first rays of sun and there’s no better place to wait for those than in this comfy seat. 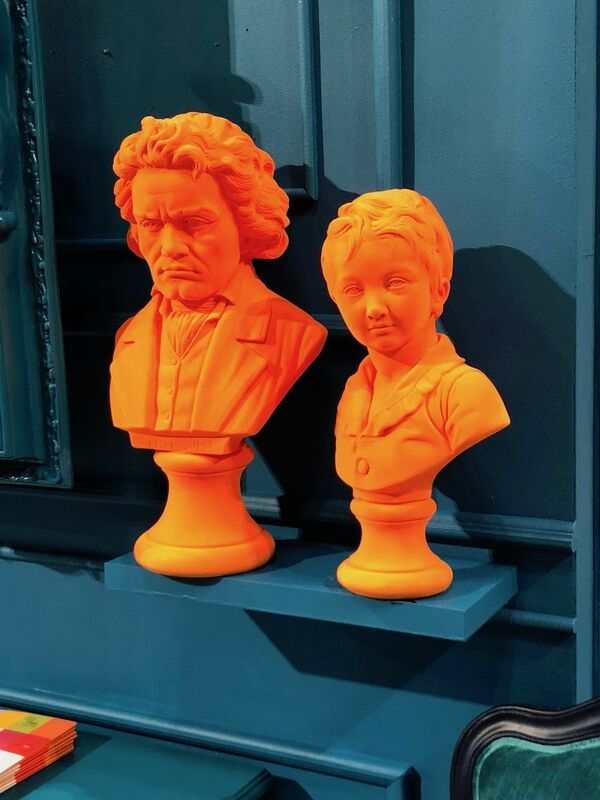 At the totally opposite end of the decor spectrum are these busts from Polart. The company has created these vibrant accessories by combining a traditional bust with their signature neon colors with a flocked finish. 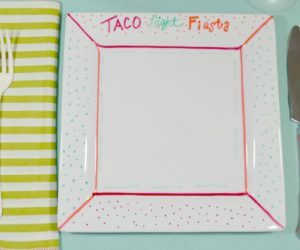 The result is a whimsical, somewhat tongue-in-cheek, accessory to brighten up any room. 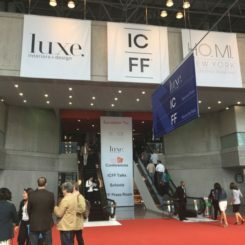 ICFF is such a big show that it’s hard to distill everything down to one list. 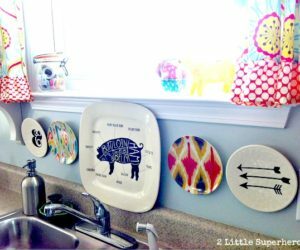 These favorites cover a range of items. 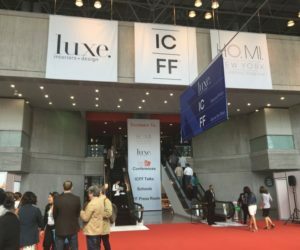 Stay tuned to Shumatsu Distortion for more highlights from ICFF.